Hippity, hoppity, Easter’s on its way! Lots of people will be searching for painted Easter eggs but Intertops Casino players are on a more lucrative quest. They're busy collecting $150,000 during the Bunny Money bonus event! Every week until May 8th the popular online casino will give $30,000 in bonuses to frequent players. They'll also award another $5000 randomly -- everyone can win. Intertops players earn points whenever they enjoy any of the casino’s hundreds of real money online casino games. Each Monday the top 300 players on the points scoreboard get casino bonuses up to $500 each. Players earn frequent player points when they play games from Realtime Gaming at Intertops Casino. 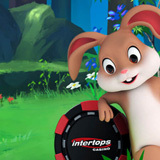 Intertops, which welcomes players from all over the world, recently launched an all new instant play casino that requires no downloading or installation. The trusted casino offers hundreds of slots and casino games from Realtime Gaming. The newest game, Secret Symbol, is an Aztec-themed slot game with a free spins bonus feature. Prizes are multiplied up to 20X. Like many of Intertops’ most popular games, Secret Symbol can be enjoyed any time, anywhere, in the new mobile casino for smartphones and tablets.